What a sad week for the London Mice...down to only two again boo hoo hoo :-( It was a full on few days of cocktails, shopping, laughing, updates, story telling and eating until we could eat no more! I actually need a few weeks to recover...tired does not do justice to how I felt on Monday!! HK mouse was as mental as ever...even more so as she got to sleep in whilst we crept around getting ready for work...fun for us!! So this week has been spent mostly getting over our tiredness, dealing with a house leak from hell (I won't bore you with that!) and preparing for the weekend ahead!! 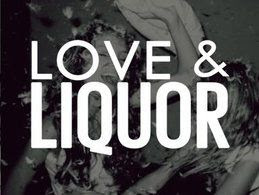 Getting tipsy on all things Love&Liquor...well we will be when we get round to trying the brand new bar that officially opened yesterday! Taking over the location from The Westbury on Kilburn High Road, a new late night downtown New York style bar opens! Apparently all exposed brickwork, metal piping, street art and even a caged VIP area....I want to go immediately! The cocktails are classics with a twist where you'll find the likes of a Velvet Elvis and Pomegranate Cosmopolitans; perfect to fuel a night of dancing to the hottest DJs! See you down there! Glowing in my brand new neon pink Urban Outfitters bra! It is the best thing I have ever purchased - I literally heart it and want to wear it on every possible occasion - don't worry I'm not! Although I actually wore it to work this week under a more sheer than I realised grey top...it is fair to say I had a few comments and instead of being addressed as Alice, I got 'oi pink bra' instead! Totally worth it though, bright pink, detachable straps, push up, bandeau shape - so super comfy and seamless...every girl's dream! Plus at £12 could it be any more of a bargain!? Day dreaming of my sister fun last week...sob sob...and one venue that is a must mention has to be the Sushi Samba / Duck and Waffle terrace! We didn't eat at either restaurant (but firmly at the top of my to-do list this month) however we had pre-dinner cocktails instead. 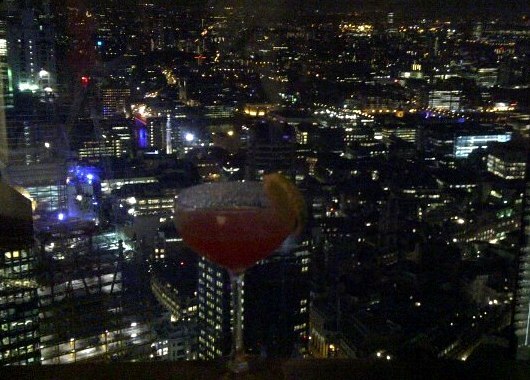 Definitely worth a visit, the views are incredible - you are way up on the 39th floor and can see all across London plus the cocktails are divine! Pick your seat either inside on the Sushi Samba or Duck and Waffle floor, or if the English rain holds off, then head out to the terrace. Definitely our preferred option - it has a beautiful bright orange tree in the centre framing the huge gleaming bar, a fire pit, lots of comfy seating and a hyper-buzzy atmosphere. We tried the Nina Fresa cocktail (One vodka is shaken with freshly squeezed lime, grapefruit, rhubarb bitters and guava juice and sweetened with strawberry purée) which were scrum! Quite a few flashy banker w*nkers but still fun none the less...as we walked out up the winding perspex staircase (beware in heels I got very disorientated!) the plates of sushi appearing from kitchen looked fantastic! Whilst the rain holds off I am planning my next visit back super quick! Faking it with the news just in of the St Tropez pop up in Selfridges. Spray tans / fake tan always scares me...a hideous experience involving wine, St Tropez and white Egyptian cotton sheets rings a familiar bell and let's just say, the results were not pretty! I therefore try to steer clear of the fake stuff and instead try to head abroad as much as possible to get the real deal, however the credit card limit is currently maxed, so if I want a tan, I'm faced with no other option but to bite the bullet and go fake! So I was very relieved when I read about the new St Tropez Skin Finishing Studio opening in Selfridges from Monday. For a bargain price of £25 you can choose from five different treatments, all hassle taken out of the disastrous process and emerge one beautiful tanned goddess! The options are...Spray Paint, an all-over, natural-looking and Shine and Polish! Shine and Polish apparently entails a deep tan with rose gold illuminator dusted on top...SOLD I defo want to get involved! If you can't face shelling out £25 then my next best recommendation would be to head to Belfast! One of my besties Katie went back home to visit and got a 'Fake Bake' tan for £10 but not as we know it!! 'Fake' being the spray tan, followed by the 'bake' being 10 mins on a sunbed...!!! You can't make these things up however apparently it was the most 'natural' fake tan ever! Finally I'll leave you with a song to get you in the Saturday spirit...inspired by the wedding I'm heading off to tonight with wait for it...an hour of old school garage at the end of the night!! I CANNOT wait...bring back those days of Watford High Street...Weatherspoons and Destiny!! !